This treatment focuses on stimulating particular pressure points on the feet (or hands) which are believed to be connected by, energy pathways, to corresponding organs and glands of the body. Doing this helps to create balance in the body and all the systems, relieving any sluggishness or blockages. Reflexology provides an incredible way to relax, de-stress and release all those built up tension and toxins that can lead to insomnia, migraines, sinus problems, hormonal imbalances, breathing disorders, digestive irregularities, circulatory and back problems. Stress, will, inevitably manifest itself in physical problems. A deeply relaxing and powerful Holistic Therapy, that concentrates specifically on the head, scalp, face, neck and shoulders. Upper back massage is also included. This is a traditional cultural massage that has been used in Asia for 5,000 years. This therapy helps to reduce stress and tension built up in the neck and shoulders, improve facial circulatory and lymphatic systems, reduce sinus problems, tension headaches, migraines and improve concentration and focus, (for when you find yourself trapped in your head and it often seems too difficult to see through the fog.) Indian Head Massage helps to reduce the physical burdens of stress that weigh heavily on our shoulders and in our head. 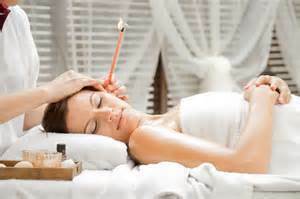 Hopi Ear Candles help stimulate blood and energy flow. Otherwise known as Thermo Auricular Therapy- is a wonderfully calming and beneficial treatment. It can help with many conditions and problems associated with the ear, nose and throat area, including; tinnitus, compacted ear wax, sore throats, hay fever, headaches, migraines, rhinitis, sinusitis, catarrh and asthma. The treatment stimulates blood and energy flow, thereby regulating the pressure in the ears and head. I will gratefully ask for a £10 deposit for any Half Body Treatments and £20 Deposit on any Full Body Treatments. I would also greatly appreciate 24 hours’ notice for any cancellations and I will be more than happy to reschedule your appointment. © 2019 Design By Prime WD, All Rights Reserved.